The weather here has been absolutely atrocious. I have totally hunkered down and have only left to pick-up the essentials and take Shay to hockey. I am so Vitamin D deprived I feel like I need to go on an IV drip. Thank goodness I take 10,000 IU’s a day. I can’t imagine how I would feel if I wasn’t supplementing. I am chilled to the bone and feeling totally lazy. They say we are likely to break the current record for the coldest December ….. EVER! I would have been happy to have that record broken in someone else’s lifetime, but what can you do? I am generally a real go getter and see holidays as the time to pump out the projects, but because I’ve been hibernating I am barely registering a pulse these days, so I’ve opted for a few days of total relaxation. Generally, I would curl up on the couch and read, but not this year! (At least not yet.) I received a really cool Christmas gift from one of my students ~ a 1000 piece puzzle. What I loved most about this gift was that when I was younger, we used to set-up a card table with a puzzle on it and putter at it over the holidays. I used to love to work our way through a puzzle and it was fun to do on your own or with another family member. What great memories this gift triggered! I started it a couple of days ago and it’s a doozy! I used to always build the outside first, but thought I would try to do all the faces first. Ugh! 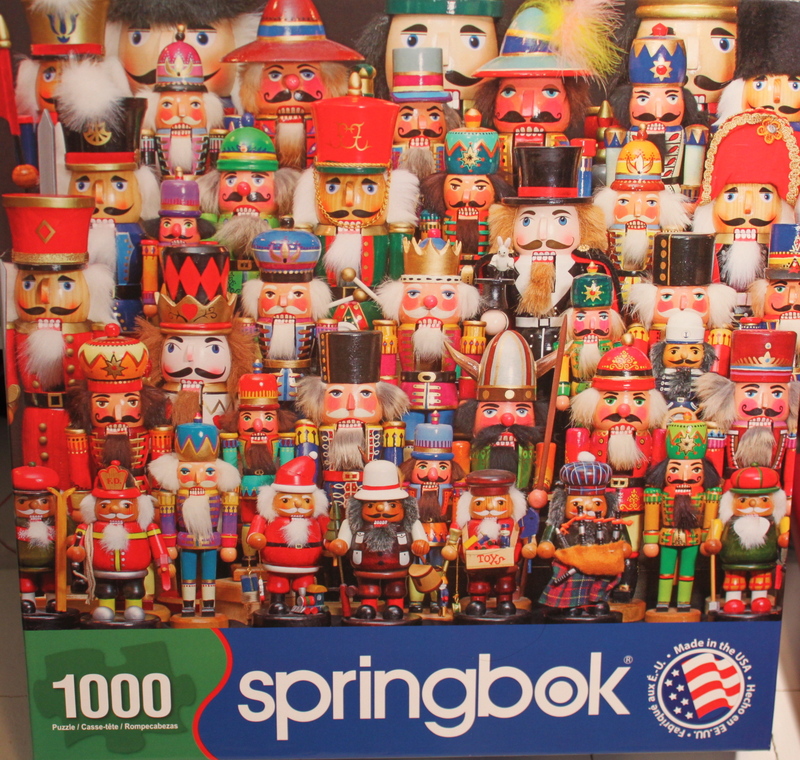 Do you have any idea how many little Nutcrackers there are in this puzzle? Well, I am totally hooked and haven’t got much else accomplished over the last few days. What a great way to escape the cold (and house cleaning). I had hoped my kids would join me, but a puzzle doesn’t “plug-in” and so they really haven’t shown much interest. They do stop by to see what progress I am making, but it hasn’t been much of a family bonding activity. Here is where I am at so far. I am finally making some headway. However, if you are looking for something to do, go pick-up a puzzle. Maybe your family will embrace the concept and you can spend some quality time together. If not, there is always the possibility that you could enjoy some quiet time relaxing on your own! The way I see it, it is pretty much a win-win situation for me. Potato Chips: Naughty or Nice? With the New Year in sight and a few extra pounds to drop after enjoying too many dainties over the holidays, it is time to get back on track. As you know, I am a big fan of Lyn-Genet Recitas book called The Plan. I have posted about The Plan often, but as I sat on the couch this evening enjoying my little bowl of potato chips, I thought I should share what Lyn has to say about potato chips. We’ve all been so programmed to believe that we can’t have potato chips and lose weight, but on The Plan, it’s not only allowed – it’s encouraged! The key to making potato chips work in your diet, is choosing a salt-free chip. If you choose a salt-free chip, many people can eat a small amount for a snack without any reactivity (weight gain). One ounce would be similar to a small plastic children’s bowl full of chips or about 13 chips. I have tried a few different brands, but find that I like the Kettle brand the best. These are available at Superstore, Wal-Mart and some Safeway stores and are comparable in price to most other chips. They are sometimes found in the snack food aisle, but you can also check the “natural food” section of the store. There is no question that they lack some of the flavour of an “all dressed” or otherwise seasoned chip, but I don’t find much of a difference between a traditional “plain” potato chip and the salt-free. Of course, there is a difference, but for me, knowing that I can eat a few chips on a fairly regular basis without feeling guilty about it, totally makes up for the difference in taste. I quite enjoy them. I like to pack a small ziplock bowl full and leave them in my car for a snack on the drive home from work. This is a satisfying little snack and without the bag there, I am not tempted to have more! Here is a copy of the Nutrition Facts. You will see there is 1% sodium in a serving of these chips. Just for comparison sake, I thought I would include the nutritional information from another name brand potato chip manufacturer. You will notice the staggering amounts of sodium, even in the lightly salted option. So, next time you go shopping and are craving potato chips, try out this healthier option and let me know how you like them. Lyn says that her favourite brand is the Trader Joe’s version. I’ll have to try those out next time we are south of the border. Happy snacking! I was really hoping to surprise my 9 year old son, Shay, with a sock monkey for Christmas. I had made Eden a sock monkey the Halloween before last to go with her sock monkey costume and he had wanted one ever since. I was so swamped prior to Christmas, I just didn’t get it done. Of course, he wasn’t really expecting it, so he wasn’t disappointed. He ended up spending the day with a friend yesterday, so I surprised him with a sock monkey when he got home. The great thing about making your own is that you can make it any colour or design you wish. Shay certainly likes the Winnipeg Jets, but he was already a die-hard Boston Bruins fan before the Jets returned. His room is a Winnipeg Jets room, but I think deep down, his heart still belongs to the Bruins. When I was considering making his sock monkey, I thought I would surprise him with a monkey in the Bruins’ colours. I searched high and low for a badge or pair of socks that had their logo, but came up empty. Instead, I just opted for their colours. To be honest, finding yellow and black socks wasn’t all that easy either. I think that is why I never got it done before Christmas. It took several shopping trips to find socks of the right colour. In the end, this is what I came up with. 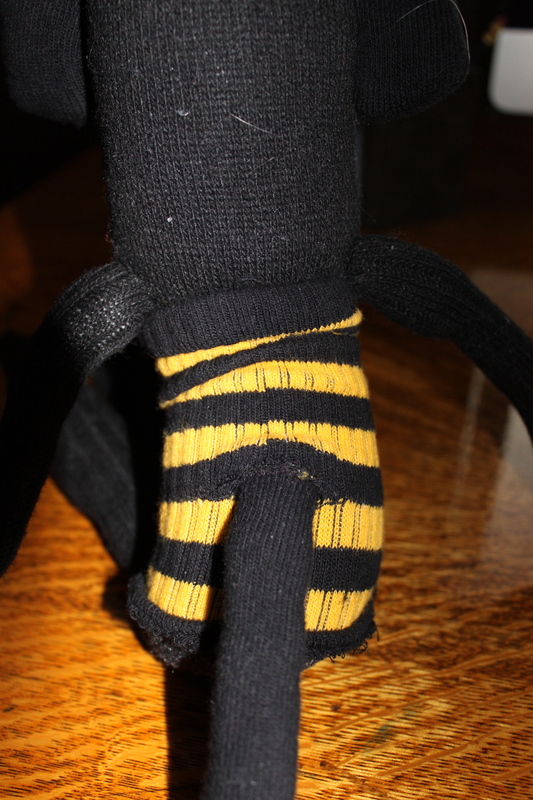 Pair of yellow and black socks (this sock is actually inside-out in this photo). I bought a package of socks at the dollar store for $3. It contained two pairs of mens “work” type socks. They were black and charcoal grey with a burgundy stripe. The socks were a bit more stretchy than a traditional wool work socks, but they worked fine. I used this pair to create the monkey’s body/head, legs, face and arms. I had to make the arms and legs a bit shorter due to the burgundy stripe. I cut them off above the stripe as I didn’t want burgundy in the final product. I used the yellow and black sock to make the tail and ears, as well as a sweater and a hat for the monkey. I didn’t use the striped yellow and black socks for the entire money because the socks were smaller, more like a kid’s size. I then followed this awesome tutorial on Craftbits (by Shellie Wilson). I used the same tutorial when making Eden’s monkey last year. I follow Shellie’s directions pretty closely, but tend to skip the pinning in most projects. It is not so much that it isn’t necessary as it is that I am too lazy to do it. Like Shellie, I use button eyes and stitch on the mouth. In order to make him a Boston Bruins sock monkey, I had to add a bit of colour to him. So, I used the yellow and black socks to make a little sweater, hat and the tail. The hat was simply made by using the toe end of the sock with a few inches of the black to turn over into a bit of a cuff (not sure if that is the right word on a hat or not??). I didn’t even hem the bottom edge of the hat. We’ll see how it holds up, I may end up having to finish the edge if it begins to unravel. The sweater was made from the top part of the sock, above the heel. I did finish the bottom of the tube by hemming it slightly. I basically just pulled the little tube over the monkey’s body and called it a sweater! I did find that the tail was a bit of a problem, so I did a button-hole stitch and then cut a slit for the tail to slide through. This seemed to work fine. His arms are actually sitting over the top of the tube sweater as opposed to making arm holes. Here is Blade with Eden’s sock monkey (which remains unnamed). I started scrapbooking when the kids were small and absolutely love it. However, I knew that my personality is such that all enjoyment would be squashed if I tried to scrapbook everything. I devised a plan that would help me to keep my scrapbooking hobby fun and not an overwhelming project on my list of things to do. You can check-out how I manage my scrapbooking in this previous post: Creative Memories: Scrapbooking for the Busy Mom. One of the books that I created is a Family Christmas Album. This scrapbooking album is strictly Christmas layouts. I love that you can flip through the pages of this album and see the growth and changes in family members through the years with the simple flip of a page. Of course, what makes this so easy, is that I only do one double page layout per year. I use a 12″ X 12″ album and with the book open, both pages capture that particular year. The very first page in the album is a single page (of course), so I decided to make it a title page for the album. I find it really funny to look back through the album as it not only reflects how we looked so many years ago, but also what a novice scrapbooker I was. You can see how I have progressively gotten somewhat better over the years. Here are a few shots of our album. I am not sure if your family purchases Christmas Crackers for the holiday season or not, but my sister in-law always has a cracker for everyone at our family Christmas dinner. It is a tradition. I am not sure where she purchases them, but I think she might get them at Costco. They are always quite elegant looking and the prizes are pretty good. This year we got a key chain, an egg timer, a set of mini dominos and a heart pendant necklace. Aside from the fun and the prizes, I also have a tradition of my own. For me the prize is much more about the packaging than the actual contents of the cracker. I always collect all of the little embellishments and take them home for use in other projects. I thought I would share a couple of repurposing ideas for those cute little cracker decorations. Here are a few shots of some of my salvaged loot from the past three years. You can see that some of the piles are already quite depleted. 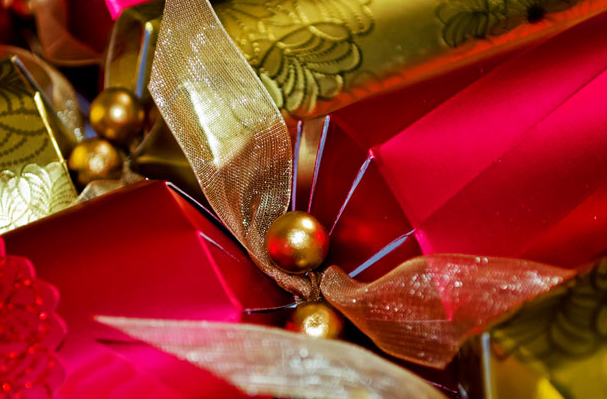 Each end of the cracker is usually tied with one or two pieces of ribbon. 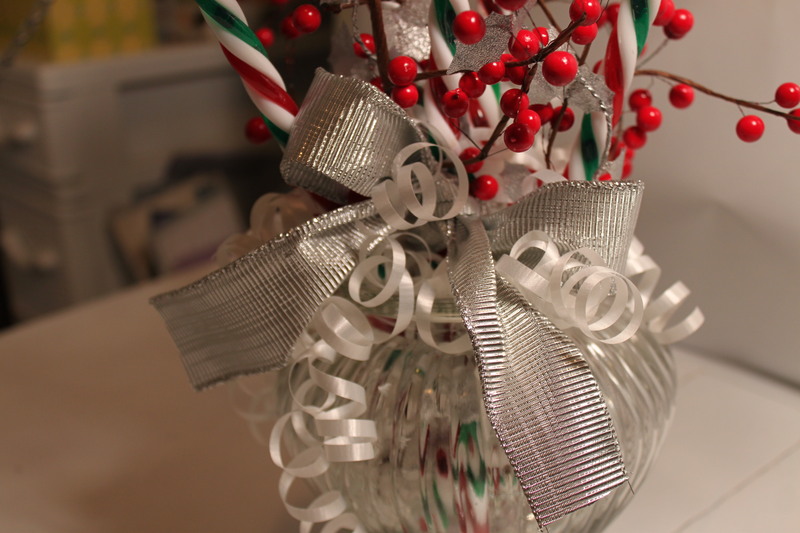 A wire with little balls on it is twisted around to make a pretty little decoration. The ribbon pieces are quite small and their uses are definitely limited, but I absolutely love those fancy little wires. I have used the small ribbons and wires to add a bit of extra charm to small gifts in much the same way as they are used on the original crackers. 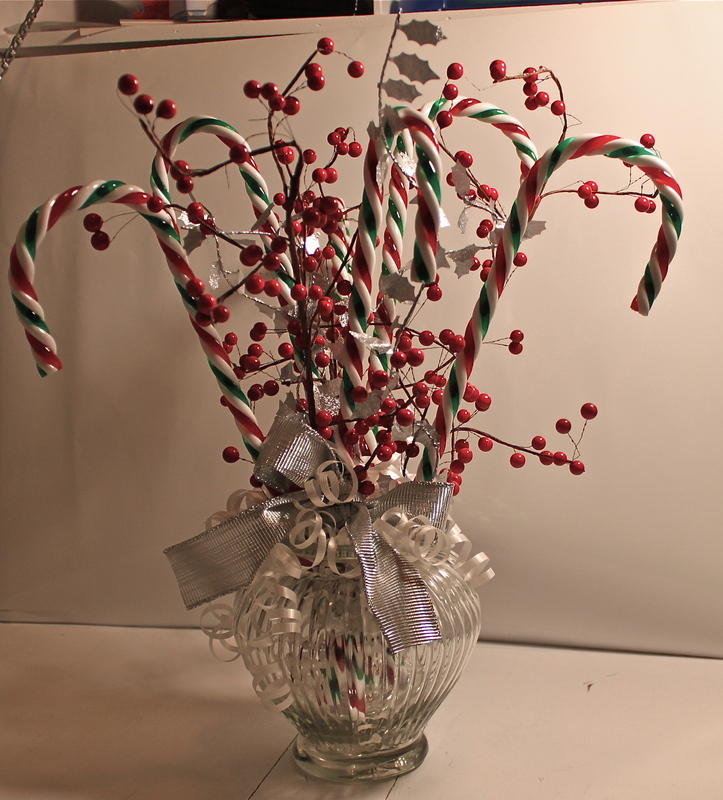 The wires and bows can also be used to add some pizzaz to a scrapbooking layout. It may be too late, but if you have some crackers hanging around that still haven’t been used or maybe you are saving them for New Year’s, don’t forget to gather all those odds and ends and add them to your stash for future use. I am not sure about you, but by the time Boxing Day rolls around, I seem to be suffering from the post-Christmas blahs! The crazy weeks of preparation, late nights and poor eating habits all come crashing down and I wake up feeling like I’ve been hit by a semi-truck. If there is one thing that I can be certain of it is that I absolutely need my sleep and my body functions best with 8 to 9 hours per night. For many, if not most, going to bed at 11 or midnight is the norm, but for me it is very rare that I stay up that late. A great game of Settlers or Canasta can definitely lure me into the wee hours of the morning, but other that I am usually off to bed before 10 with 9 being my favourite time to hit the sack. I do find with the kids getting older and staying up later, my 9 o’clock bedtime is becoming much less frequent and more of an occasional luxury. This month has been crazy busy and I found myself collapsing into bed after 11 most nights. All of those late nights and lack of sleep have certainly taken their toll. My eyes are super puffy with big bags under them and my stomach has been uncomfortable for days. The great news is, that I know just what to do to get back on track. The thing I love the most about The Plan is that I have already determined many of the foods that are “friendly” for my body. Throughout the holidays it is difficult to be in complete control of what you are eating as you are often out and about. I have previously done several posts regarding The Plan and how impressed I am with Lyn-Genet Recitas’s book. I know this is the time of the year when so many are making New Year’s resolutions and planning to shed the Christmas pounds or get back to the gym. Lyn’s book is “hands-down” the best source I have come across. I love that The Plan does not tell you what you can and can not eat, but rather teaches you how to discover what foods work for you and which foods don’t. It is completely different for every individual and allows you to have the control over your own body and how you feel. One of the biggest pitfalls that we fall into is assuming we are eating well because the media has told us what “super foods” we need in our diets to be healthy. One of the most fascinating parts of Lyn’s book is learning that your “go-to” healthy foods might be causing the most havoc on your body. Lyn refers to the following 7 foods as the “Devil Foods” because so many people are “reactive” to these foods. Basically, this means that the foods cause your body to react and set it into an inflammatory state which often results in weight gain as well as other symptoms. The list of Devil Foods is quite surprising to most. Most of the items on her list were regular items in my diet. I believed that salmon was a super foods and we had it once a week faithfully. We often chose ground turkey over beef, believing it to be a superior choice for healthy eating. Asparagus is one of our families favourite vegetables. Not really the foods you would expect to see on such a list. The point is not that these are bad foods, but more so that people are consciously choosing these foods believing that they are making a healthier choice when in fact some or all of these foods can be highly reactive for many people. So, the result is that roller coaster of weight gain and loss. Have you ever been eating super “healthy” and still gained weight or would lose a few, gain a few. That happened to me all the time, but as soon as I read this book I knew why. Although I have discovered other foods as well, I have discovered that I am highly reactive to many types of fish. We ate fish one to two times per week and for me, a small fillet of fish can cause me to gain up to 2 pounds within 8 hours of consuming it. So you can see how you could be eating really well, but every time you consume that reactive food, you jump back up a few more pounds. If you struggle with your weight or even just want to get off those last few pounds, I swear, this is what you have been looking for. I am not going to lie. The first 20 days take quite a bit of commitment because you need to get your body into a “friendly” state, so that you can test foods and get accurate results. However, once you begin to discover the keys to success, you will always have that knowledge to go back to. The Plan doesn’t prevent me from eating anything at all, but it just helps me to read my own body better, make better choices that work for me and most importantly, have the tools to get back on track when I derail and know I am in a reactive state. This is my absolute favourite everyday salad. I never tire of it and it is really delicious and super easy to make. The dressing is courtesy of the The Plan. I make a batch of dressing every Sunday and it lasts all week. Mix and store in the refrigerator for up to one week. Makes 6 to 8 servings. This salad tastes like “summer” to me, but is great for any time of the year. It is light, yummy and looks incredible. We will be having this salad for dinner tonight with some left over Borscht. Mmmm good! beyond the stores and all the decorations. You’ll find I’m waiting there for you. I had an old puzzle with pieces missing and was waiting for the perfect project to use them up. I came across this idea on Made By Me and decided these little homemade angel ornaments would be the perfect gift for my awesome neighbours. We are so lucky to live on a street that is filled with kids similar to the ages of our own. It has been such a blessing having each one of them as friends and mentors for our children. Each is unique and we all have different gifts and abilities that we bring to the neighborhood. Together, we sort through the challenges of raising a family and try to support each other through the bumps in life. We are so fortunate to have found a home on such a great street. When thinking about using the puzzle pieces for this project, I couldn’t help but think about how our neighbourhood was much like a puzzle. A puzzle contains a set of pieces that are all different, but each one is vital to the overall design of the completed picture. This is much like our neighbourhood, with each person contributing to our little “village” in their own special way and vital to the “village” as a whole. Take an old puzzle piece and gently sand the surface. Add a very thin coat of white paint. Dry and lightly sand to distress slightly. Draw on angel with a pencil. Paint the angles and then use a black Sharpie to add details. Add a small star cut (or punched) from light cardboard like a cereal box. Here are the completed angels with a little glitter glue added to the head for a halo and the star for a bit of shimmer. I pierced the top with a needle and thread silver string through for hanging. I was awake one night planning this project and thinking about how I might be able to articulate my thoughts regarding the little angel puzzle piece ornaments. I thought of writing something, but I am really not much of a poet. I tried several google searches and came up with what I deemed to be the perfect poem. This poem is called the Prime Puzzle and was written by Rabbi Lawrence Kushner. This post is dedicated to all of the wonderful people in our neighbourhood. We value your friendship, kindness and support. We are truly blessed to have each of you in our lives. Merry Christmas! My dad is Ukrainian, but my mom was not. Despite their different backgrounds, my mom embraced the Ukrainian traditions of my dad’s family and we began to celebrate Christmas Eve ~ Ukrainian style. As a child, I can vividly remember (okay more like vaguely ~ I don’t have the best memory) spending every Christmas Eve with my dad’s family. We would eat a very traditional Ukranian meal with the 12 meatless dishes. This consisted of an appetizer of “wheat” (Yuck ~ I tried it every year, but never did acquire a taste for it!) followed by borscht. The main meal included perogies (potato, cottage cheese and prune), cabbage rolls (sour and tomato), beet rolls, fish, creamed mushrooms, and some buns. I am not sure if the 12th dish varied from year to year or not as I am having trouble remembering it. I know we always had headcheese (not meatless), but can’t remember if it was part of the meal or served later in the evening after midnight mass. I know we also ate pyrizhky (tiny little buns stuffed with sauerkraut). It was always an awesome evening filled with great food, family and plenty of card games. I will always cherish those family gatherings at my Aunty Dora’s. I don’t remember gifts ever being a big part of our celebration. I am not saying there weren’t any, but it was certainly not the focus. It was about family and celebrating the birth of Jesus. 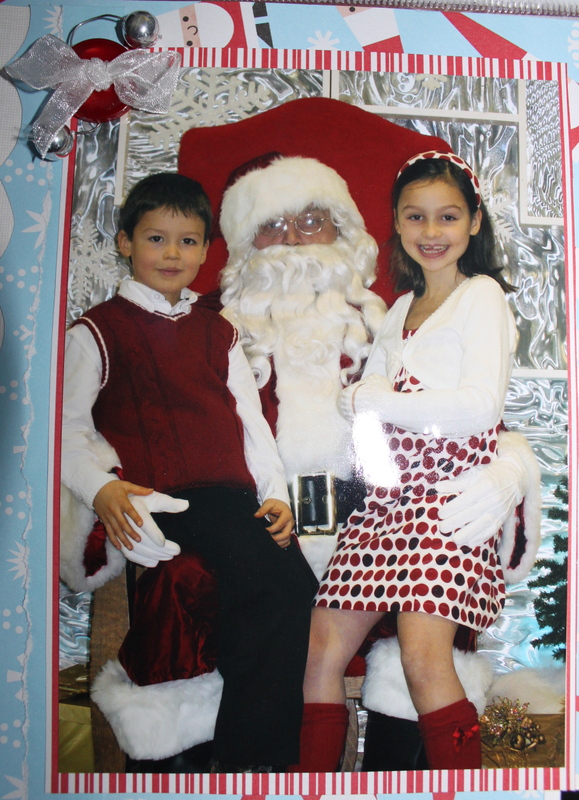 When Tim and I were married, we agreed that we would spend Christmas Eve with my family and Christmas Day with his. This has always worked out well for both of us and we are blessed that both of our families are close enough that we never have to choose between the two. 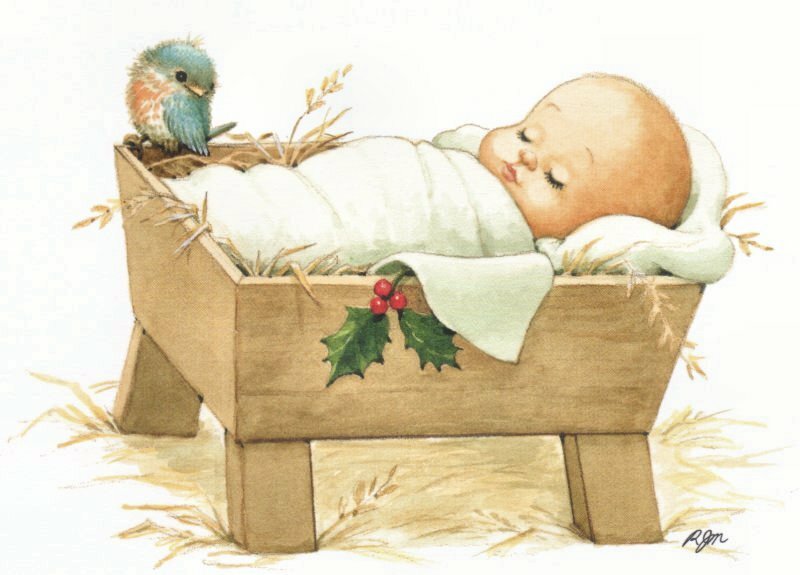 We have always attended a Christmas Eve service, but no longer go to midnight mass. Springs Church usually offers multiple service times, so we opt for an early service and then head home for a later dinner. Church is only an hour, but the service is always fantastic and you never quite know what to expect. Our church is far from traditional and the contemporary nature always makes the evening quite spectacular and really sets the tone for the entire Christmas experience. We leave filled with the spirit of Christmas and ready for an awesome evening of fun and festivities. For many years, my mom and dad would host Christmas Eve dinner, but my mom and I would share the preparations and do much of it together. When she passed away in 1999, we carried on in much the same way, but I took over the roll of hosting. Over the years, we have scaled back on our menu and have stuck to the dishes we like the most. We have made some additions and removed a few items from our meal plan, but much of what we serve has remained the same. My dad was 63 when my mom passed away and he immediately took over the role of helping prepare Christmas Eve dinner. He even made mom’s Christmas cake for the first few years after her passing ~ what a trooper! Now almost 77, dad still prepares a good portion of the meal. He makes beet rolls (like cabbage rolls but made with beet leaves), sour cabbage rolls, cabbage rolls with tomato sauce, and he even made the perogies this year! I make my Mom’s Borscht (so delicious! ), fresh buns, fish, nalysnyky (Ukrainian Crepes), and creamed mushrooms. If I have beet leaves, I also make beetniks. These delicious little morsels are made by wrapping a beet leaf around bread dough. You bake it as you would a bun and then warm them in a whipping cream and onion sauce. To die for, seriously. I found a link to a recipe that looks pretty similar to what I do. I don’t actually have a recipe, but this gal’s post seems to be pretty much bang on. The only extra tip I have is that I always pop my leaves in the freezer. When you take them out and thaw them they are nicely wilted and much easier to wrap. So, you can see we are down to about 9 or 10 dishes, depending on the year. Of course the meal is super delicious, but very rich and high in calories. Everything is either made with or served with butter and/or whipping cream sauce. In fact, if you count the cream sauce and the butter and onions we set on the table to smother our food with, I am sure you could make it up to the “12 dish” count! It is for this reason, that this meal is restricted to once a year. We indulge, until we bulge, and then restrain ourselves for another year. We no longer have a traditional Christmas Eve dessert. Sometimes I make a fancy dessert and other times, we just eat Christmas baking. I do miss my mom’s incredible mince meat tarts with ice cream that were our traditional dessert when my mom was alive. I might give them a whirl one year, but I don’t know if I can find her recipe and they just wouldn’t be the same if it wasn’t her recipe. After dinner, the kids are allowed to open one gift from us (usually new PJ’s) and any gifts from my side of the family. I only have one brother and his family is not always able to join us, so sometimes it is just my dad and the four of us. My mom always had her heart and door open to those who didn’t have family to spend the holidays with and I too try to include anyone that is without family or a place to go. We are thrilled to extend the invitation to others, as no one should be alone at Christmas time. Of course, it would not be a Wasslen Christmas with games. The evening usually ends very late after a few board games with the kids and a round or two of Canasta with the adults. 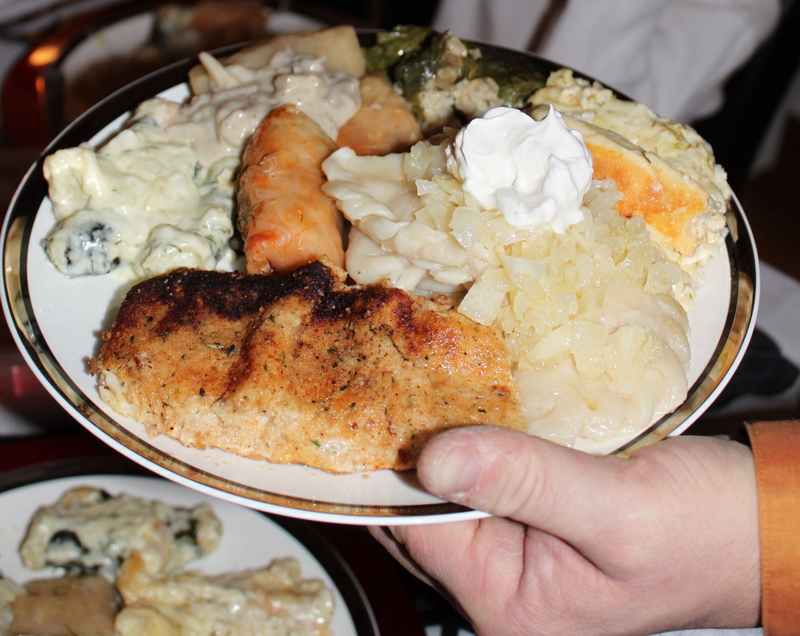 This is our traditional Ukrainian Christmas meal which we always have on Christmas Eve. Using a non-stick pan, spoon a small amount of batter in the pan to form a thin crepe. (I tend to make my crepes about 3 to 4″ wide and about 6 to 7″ long ~ more rectangular in shape. I just find this works better for rolling and holding the filling). Cook until just beginning to brown. If your crepe is thin enough you will not need to fiddle with trying to flip it over as it will cook right through. I transfer the cooked crepes to wax paper and then stack them in layers. You can fill them as soon as they are cool enough to handle. You can also wrap the stacked crepes in cellophane and store them in the fridge until you are ready to fill them. Mix the filling ingredients in a bowl. Fill the crepes and roll them up. Place them in the bottom of a greased baking dish. Cover with cream sauce and bake at 350 degrees for about 30 minutes or until bubbling. Dice a large onion (or more – you can never have too much onion) and sauté in a generous amount of butter (about 1/2 cup?). Add about 1 to 2 tablespoons of flour and stir it in to soak up some of the butter. Add 2 cups of whipping cream and about 1/4 cup of fresh dill. Simmer until the sauce thickens. Sauce should be a yellow colour. This sauce is excellent served on beetniks, beet rolls, nalysnky or on perogies in lieu of sour cream. This recipe is one of our favourites and is always a hit at potluck dinners. If you are bringing a dish to a family gathering this season, it is a guaranteed hit. I also love that you can make the crepes ahead of time and store them in the fridge until they need to be baked. Enjoy!